Current Mode Preamplifiers convert the current output of a photovoltaic Ge, InAs, or InSb detector into a voltage output. 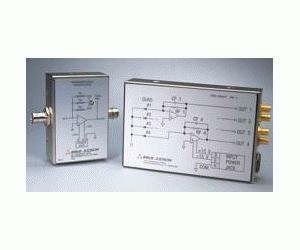 They amplify the signal for subsequent use with oscilloscopes, lock-in amplifiers, or A-to-D converters. Three different preamp models each offer specific advantages, depending on detector type and bandwidth requirements. All units (except multi-channel models) have switch-selectable gain. The PA-5 is recommended for low impedance detectors (RD<400ohm), including J12 Series room temperature InAs and J12TE2 Series InAs. It has extremely low voltage noise and low voltage offset. However, its high current noise and current offset make it unsuitable for detectors with high impedance. Standard gain is 105, 104, and 103 V/A (switch-selectable). Custom gain settings are available.